At the very front of the store is the now infamous bright pink monster truck, with pink dollar bills raining down over it. A little reminiscent of Britney Spears’ hummer in her Do Somethin’ music video, this is just the first entertaining and heavily pink aspect of the store! We had to wait a good five minutes to take a photograph, as customers surrounded the monster truck for the perfect selfie! 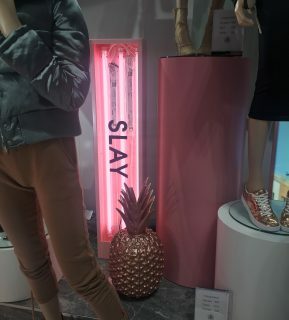 Upon entrance, we were immediately introduced to the three aspects which resonated throughout the entirety of the store: digital screens, sassy catchphrases and of course, pink. 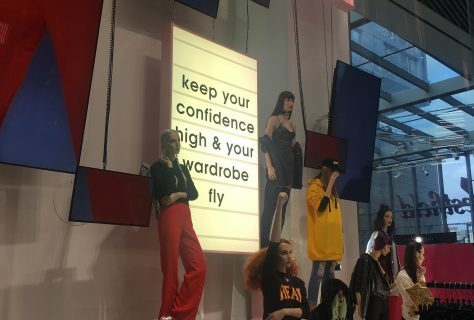 Screens dominate either side of the entrance showcasing models wearing branded clothes and pink lightboxes highlight favourite mottos such as ‘dresses worth shaving your legs for’, ‘hustle’ and ‘slay’. We found all this within our first few steps inside, but it’s clear to see that the rest of the store keeps up this fun, girly and interactive aesthetic. 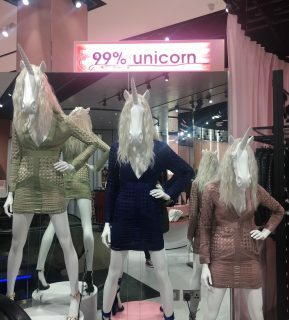 Three mannequins are adorned with unicorn heads underneath a 99% Unicorn lightbox, underwear polaroids are attached to mesh wire with the phrase ‘Send Me Nudes’ lit up above and lifesize flamingos (some being ridden by edgy mannequins) are all part of the shopping experience at Missguided. 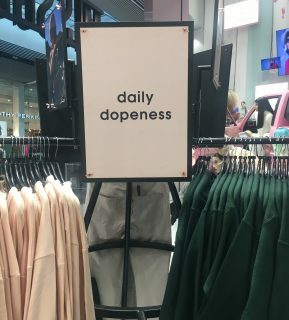 The quotes continue throughout the store with ‘this jacket tho’, ‘daily dopeness’ and ‘my stay in bed all day game is too strong’ being our favourites. It’s clear to see from the sassy catchphrases + funky props (pineapples, hashtags, blinged dollar signs to name just a few) that social media has played a huge role in the design of this clothing store, promoting customer engagement with both the brand and the products. 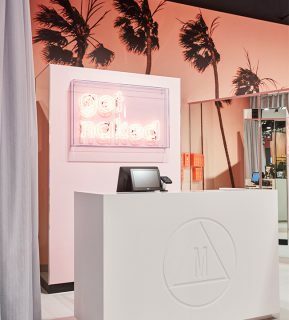 As millennials become more of a target focus for retailers across the globe, Missguided has not missed a beat when introducing this social trend into its physical retail. Finally, we can’t end this blog post without mentioning the footwear and changing room areas. Footwear - or Shoeniverse to be precise - can be found upstairs, sectioned into a circular shape with textured pink backdrops and dozens of circular mirrors. Whether you want a new pair of shoes or not (and we’re guessing you will once you get in there) this part of the store screams premium and just makes you feel fab! If you’re like us, you know that changing rooms are usually the worst places and we often avoid them at all costs. However, Missguided have taken the fear of changing rooms and flipped it on its head. You’ll find them easily between the pink unicorn dreams vending machine (bottle water actually) and the ‘Get Naked’ neon sign! With pink painted walls adorned with palm trees, they’ve taken the fear out of changing rooms and injected them with fun. This flagship for Missguided has changed the rules for female fashion stores and highlighted a seamless digital-to-physical transition so we’re intrigued to see how all of their future stores pan out. You can find the Missguided flagship on the first floor of Westfield Stratford City – we recommend checking it out just for the experience.